ESSENTIAL QUESTION: How can you describe the relationship between two place-value positions? Objective: Reason concretely and pictorally using place value understanding to relate adjacent base ten units from millions to thousandths. How does the value of a number change as the place value changes? 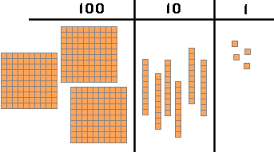 ​Recognize that in a multi-digit number, a digit in one place represents 10 times as much as it represents in the place to its right and 1/10 of what it represents in the place to its left. 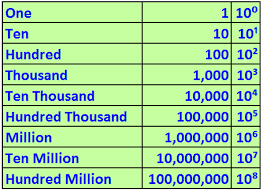 ESSENTIAL QUESTION: How do you read, write, and represent whole numbers through hundred millions? ESSENTIAL QUESTION: How can you use an exponent to show powers of 10? 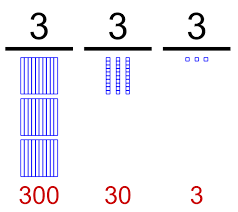 ESSENTIAL QUESTION: How can you use a basic fact and a pattern to multiply by a 2-digit number? ESSENTIAL QUESTION: How do you multiply by 1-digit numbers? ESSENTIAL QUESTION: How do you multiply by 2-digit numbers? Find whole-number quotients of whole numbers with up to four-digit dividends and two-digit divisors, using strategies based on place value, the properties of operations, and/or the relationship between multiplication and division, illustrate and explain the calculation by using equations, rectangular arrays, and/or area models. ESSENTIAL QUESTION: How is multiplication used to solve a division problem? ​Find whole-number quotients of whole numbers with up to four-digit dividends and two-digit divisors, using strategies based on place value, the properties of operations, and/or the relationship between multiplication and division, illustrate and explain the calculation by using equations, rectangular arrays, and/or area models. ESSENTIAL QUESTION: How can you use the strategy solve a simpler problem to help you solve a division problem?